I can't help it. Every so often I have to plug my book -- a duty made easier by the recent flow of reader praise. So here goes. I wrote a book called Rethinking Worldview: Learning to Think, Live, and Speak in This World, which was released by Crossway around this time last year. It's not bound in goatskin. It doesn't even have a sewn binding. But if you like this site, I'm guessing you'll enjoy the book, too. 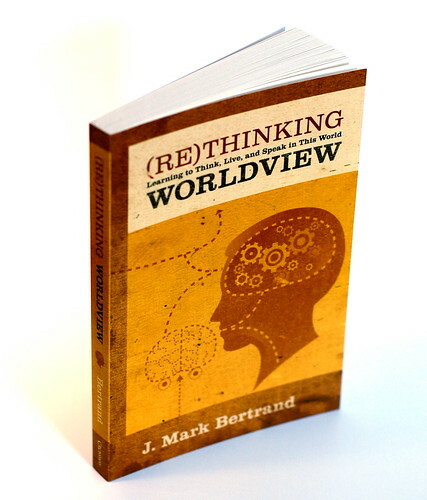 Today, CPYU Bookshelf published an interview with me about Rethinking Worldview, which you can read here. If you're a Mars Hill Audio Journal subscriber, you can listen to my chat with Ken Myers at the beginning of Volume 90. There are more book-related resources at www.rethinkingworldview.com. And if you do read the book and enjoy it, please recommend it to others -- and if you're really crazy, think about posting an Amazon review or something like that. It will be greatly appreciated. Bertrand Withdrawals? Buy the Book.